Environs de Paris. Dresses par Beuvelot (J. B.) d'apres la Carte des Chasses, d'autres Cartes particulieres et des reconnaissances faites par lui sur differentes pointe. This is an extremely attractive c. 1850 map of Paris, France and its environs by French map publisher Andriveau-Goujon. Covers the Paris area from Vaux in the northwest to Dampiere in the southwest to Juilly in the northeast and Grisy in the southeast. Detailed to the level of individual buildings with palaces, churches, roads, railroads, rivers, forests and gardens noted. Shows the elaborate gardens surrounding Paris, in particular the gardens of Versailles. Dissected and mounted on linen. Comes with original marbled paper slipcase. 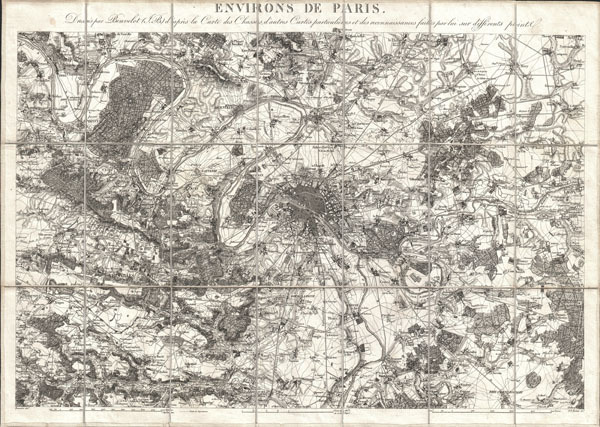 One of the finest and most highly detailed maps of the environs of Paris we have encountered. Very good condition. Dissected and mounted on linen in 21 sections. Original linen in find conditon. Comes with original marbled cardboard slipcase.